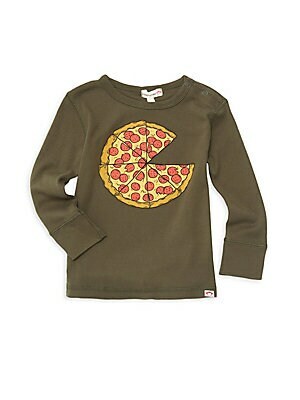 A cartoonish pizza graphic fronts this adorable long sleeve tee. Roundneck with ring snap closure Long sleeves Pullover style Cotton Machine wash Imported. Children's Wear - Contemporary Children. Appaman. Color: Forest Night. Size: 12-18 Months. A colorful flamingo graphic accents this colorblock rash guard. Crewneck Short sleeves Pullover style Elastane/nylon Machine wash Imported. Children's Wear - Contemporary Children. Appaman. Color: Black. Size: 10. A colorful flamingo graphic accents this colorblock rash guard. Crewneck Short sleeves Pullover style Elastane/nylon Machine wash Imported. Children's Wear - Contemporary Children. Appaman. Color: Black. Size: 12-18 Months. A colorful flamingo graphic accents this colorblock rash guard. Crewneck Short sleeves Pullover style Elastane/nylon Machine wash Imported. Children's Wear - Contemporary Children. Appaman. Color: Black. Size: 18-24 Months. 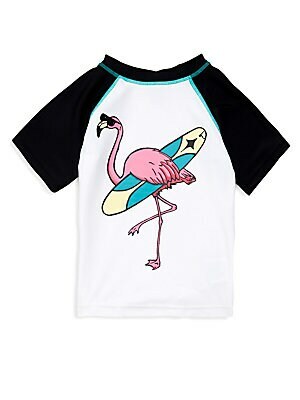 A colorful flamingo graphic accents this colorblock rash guard. Crewneck Short sleeves Pullover style Elastane/nylon Machine wash Imported. Children's Wear - Contemporary Children. Appaman. Color: Black. Size: 2. A colorful flamingo graphic accents this colorblock rash guard. Crewneck Short sleeves Pullover style Elastane/nylon Machine wash Imported. Children's Wear - Contemporary Children. Appaman. Color: Black. Size: 3. A colorful flamingo graphic accents this colorblock rash guard. Crewneck Short sleeves Pullover style Elastane/nylon Machine wash Imported. Children's Wear - Contemporary Children. Appaman. Color: Black. Size: 3-6 Months. A colorful flamingo graphic accents this colorblock rash guard. Crewneck Short sleeves Pullover style Elastane/nylon Machine wash Imported. Children's Wear - Contemporary Children. Appaman. Color: Black. Size: 5. A colorful flamingo graphic accents this colorblock rash guard. Crewneck Short sleeves Pullover style Elastane/nylon Machine wash Imported. Children's Wear - Contemporary Children. Appaman. Color: Black. Size: 6. A colorful flamingo graphic accents this colorblock rash guard. Crewneck Short sleeves Pullover style Elastane/nylon Machine wash Imported. Children's Wear - Contemporary Children. Appaman. Color: Black. Size: 6-12 Months.